Take a trip into 'The New York Times’ much-loved “36 Hours” travel column in one day! Always a draw for American history buffs (and Rocky fans), Philadelphia also has exceptional food, local craft beer and eclectic art to add to its long list of attractions. Inspired by tips from Times journalists and local experts, on this tour we'll try some of the city's best foods (hello cheesesteak! ), visit the waterfront and enjoy a few drinks together too. Expect a local's perspective, hands-on experiences and behind-the-scenes access courtesy of The New York Times'. Begin your tour in the heart of modern Philadelphia. Surrounded by the largest concentration of food, drink and entertainment options in the city, this beautiful green space is the perfect people-watching location. At DiBruno Bros, a famed local purveyor of meats and cheeses, the old world meets the modern. We will stop at the newer outpost of this Philly institution, which dates back to 1939. Here we will taste some cheeses with an expert DiBruno cheesemonger, exploring products that were produced both locally and around the world. Next, we will head toward one of the most creative and dynamic new spaces in Philly, Dilworth Park, which opened in 2014 as a replacement for the rather mundane Dilworth Plaza. With City Hall as a dramatic backdrop, Dilworth Park is always lively. After a look around, we’ll hop on the subway to venture to our next neighborhood, Old City, for a taste of Philly’s most famous dish, the cheesesteak. We’re heading to Campo’s, a classic, family-owned joint, where the friendly team will take you through, step-by-step, the process of creating this famous sandwich. You will even have a chance to get behind the grill to cook and assemble your own cheesesteak, no pressure! 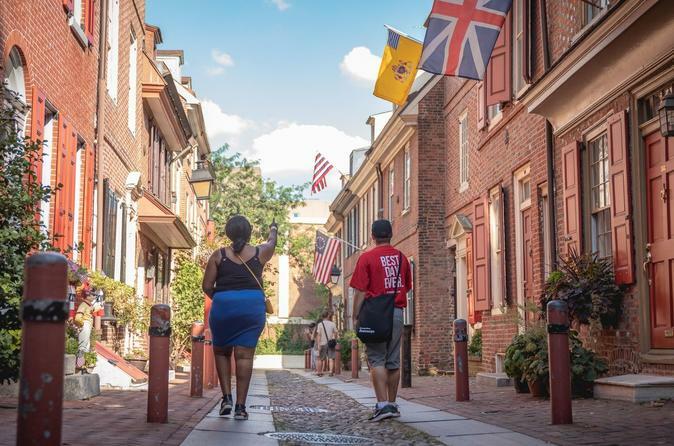 A walk through Old City toward Philly’s emerging Delaware River waterfront is next. For most of its existence, this was been an industrial waterfront which hasn’t held much appeal to your average Philadelphian. This is all changing now with new parks and innovative spaces springing up along the waterfront. Start with the Race Street Pier: this former garbage pier now provides one of the best views of the river and Philly’s famous Ben Franklin Bridge. Across the street sits a formerly abandoned water pumping station which is now home to a performing arts center, restaurant and beer garden; Fringe Arts has taken creativity to the next level. Spend a happy hour in this amazing space and chat with the production or technical staff. If there’s time we’ll take a short tour of the building as well. We’ll enjoy a cocktail (or something else you fancy) and soak up the atmosphere. Occasionally, Fringe Arts is closed to the public for private events and performances. If this happens don’t worry! We will visit the Arden Theatre Company instead, one of the city’s best, located in a historic former post office building. Here we’ll chat to the actors or production crew, depending on their availability and get a behind-the-scenes tour of this creative venue. Philadelphians look forward to both winter and summer along the waterfront and for good reason. Winterfest brings what was effectively an empty parking lot alive with fire pits to roast s’mores, a cozy lodge serving warm festive beverages or cold beer and an ice-skating rink. In the summer, Spruce Street Harbor Park is a spectacle of floating gardens, hammocks between the trees, multiple beer gardens, food served out of old shipping containers and floating barges on which to relax.